Last night was my last night at Minnesota Adult and Teen Challenge. I'm a graduate, and I am a new creation in Christ! I went there for the first time on August 10 and have spent fifteen hours a week in or on my way to class and countless hours completing my homework. One of the first assignments was called "Renewing Your Mind" and every person who completed it really did find renewal and blessing in the work necessary to complete that assignment. Many more followed - sexual integrity, healing after abuse, worry, anxiety, fear, relapse prevention... Every hour I spent in the pages of those assignments changed my life, my heart, and my spirit. Those assignments were not the typical treatment work. They were developed over a couple decades by our teacher and therapist, Lori. She has such an incredible heart for God and a deep, abiding love for others. She poured her heart into the assignments she created. Every paragraph provoked thoughtful examination of conscience in me and in others in my classes. The questions we answered forced us to search our hearts for truth and share brutal and painful realities. Each of us who completed those assignments learned about ourselves and developed a new relationship with Christ and confidence in our recovery. I am so glad I did that work, even though it was the hardest work I have ever done. I am going to miss my classes and my sessions with Lori, but I am also ready for the next phase of my life and ready to be done with all those hours of introspection and healing. Don't get me wrong - healing has only begun! But it's time for a new, independent phase of healing. I plan to remain involved in recovery programs and I plan to share my story with anyone who will listen. Last night I shared part of my story with the newly formed coed group. Our Christian women's group underwent the transition to a co-ed treatment group last Monday. Considering that much of my trauma has been inflicted by men, the transition was not a happy event for me. I would not have talked about many of the things I talked about over the last four months had my group included men from the beginning. That is not a commentary on men! It is certain knowledge that my journey would have been vitally different had it not occurred in the exclusive company of Christian women. During our first coed meeting, I articulated my concerns. Women's voices are so valuable and studies indicate that those voices are often silenced in the presence of men. There are many reasons for that, and I don't care to debate them. It is what it is. Because I knew that, I chose to drive two hours round trip to attend a group that was exclusive to women, and even more exclusive to Christian women - women who desired a stronger relationship with Christ and who will freely admit their inability to conquer their addictions without Christ. One of the men in the group respectfully pointed out that sharing my story among those men - men who are also weak and wounded - could foster a deeper understanding of women's experience, and those words resonated with me. When I wrote a concise recap of my experience, I wrote it knowing I would share it with men. My recap is brutal and cold. I didn't talk about so many issues that created the collateral damage in my life. I talked about the bare bones and the ugly consequences. My recap took the form of a goodbye letter to alcohol, my drug of choice. After reading it, each person said something to me. Their very sincere words told me that my testimony mattered to them. And, you know? Their words matter to me. I won't forget the things they said or how they recognized Christ in my life. I won't share what they said either. Those words are all mine. They give me hope for the future and confidence that I am letting the light of Christ shine. 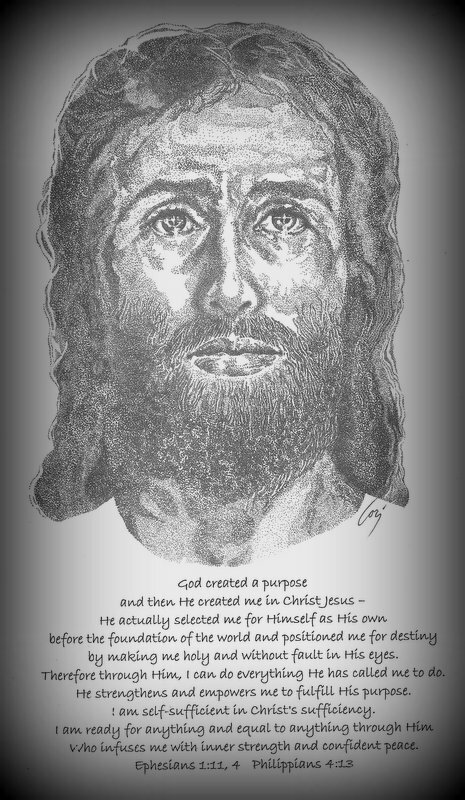 My friend and therapist, Lori, gave me her rendition of Jesus with the Word given to her for me by the Holy Spirit. God created a purpose and then He created me in Christ Jesus - He actually selected me for Himself as His own before the foundation of the world and positioned me for destiny by making me holy and without fault in His eyes. Therefore, through Him, I can do everything He has called me to do. He strengthens and empowers me to fulfill His purpose. I am self-sufficient in Christ's sufficiency. I am ready for anything and equal to anything through Him who infuses me with inner strength and confident peace. Over several years Jakob gave me many gifts with the same verse: I can do all things through Christ who strengthens me. Man! Did he ever hit the nail on the head! I left last night after sharing the words my friend Pat shared at yesterday's Rotary meeting: do not curse the darkness; instead light a candle.